And lo, on the night of the second Republican presidential debate, a great surge of confused, curious viewers asked the same question in unison, rising as if one: "Where is Rick Perry?" You know, the former governor of Texas? The guy who provided one of the most infamous primary debate blunders in modern history? With the federal indictment and the hipster glasses and the affinity for maple syrup! Whatever happened to that dude? Well, I've got some bad news for you. If you were eagerly tuning into the GOP debate tonight in the hopes of seeing Perry take the stage, first of all, don't worry — there's still Donald Trump to kick around. But you're probably still going to be sorely disappointed with this news: Perry isn't at the debate because he isn't running for president anymore. He had to abandon his bid last week amid dwindling cash, basement-level polling numbers, and the self-evident reality that he had about as much chance to win the nomination as Jim Gilmore or George Pataki. 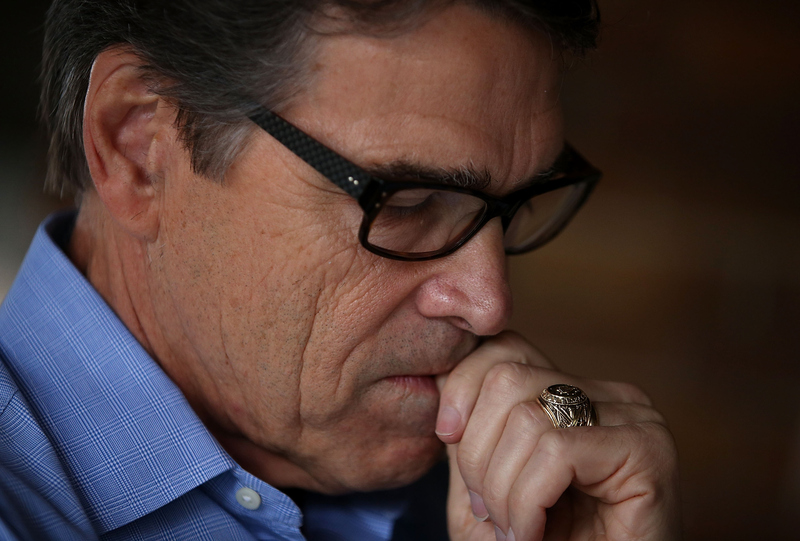 It was a swift decline for Perry. Back in the 2012 presidential election cycle, he was seen as the biggest, most credible Republican threat to Mitt Romney — up until the moment he actually jumped into the race and started fizzling out all over the place. In fact, his fortunes turned so drastically that this cycle, with a mind-numbingly packed primary field, he barely got a trace of attention, kicked to the back row in favor of newer hotshots like Ben Carson, Marco Rubio, Jeb Bush, and the aforementioned Mr. Trump. The attention shortage he was campaigning under was so severe, in fact, that you're forgiven if you didn't realize he'd dropped out — there are still a whopping 16 candidates in the Republican race, after all. But sadly for all of us who love a good chuckle at a cringeworthy moment (or just that thick Texas drawl), Perry's time on the national stage has come to a close for now.